I still couldn’t believe those words – I believe I need a C-section – had left my mouth, and then I had to say them again, about 45 minutes later, to the doctor when she returned. In the time in between, I felt a curious sense of relief, this lightness like a huge weight had been taken off of my chest. I felt that I had made the right decision – that voice that had been shouting at me louder and louder to listen to my instincts quieted for a while. Telling the doctor what I wanted and why was difficult, again. While she and I had our differences then, and have had differences again since, I do firmly believe she had me and my best interests at heart. I believe she was listening to my midwife when she said I really wanted a natural birth, and that’s probably honestly why she let me go as long as she did – under different circumstances, without my midwife’s warning, she might have called for a C-section earlier, but she wanted me to have the chance to birth the way I wanted, even if that wasn’t her way. Even on that day, I understand we had a sort of impasse of worlds, different outlooks and lifestyle, and I didn’t waste a lot of time trying to explain too much to her. I told her the basics of my decision, and after some discussion, she agreed we would do it. I had thought maybe things would move very quickly at that point, but this wasn’t an emergency caesarian. 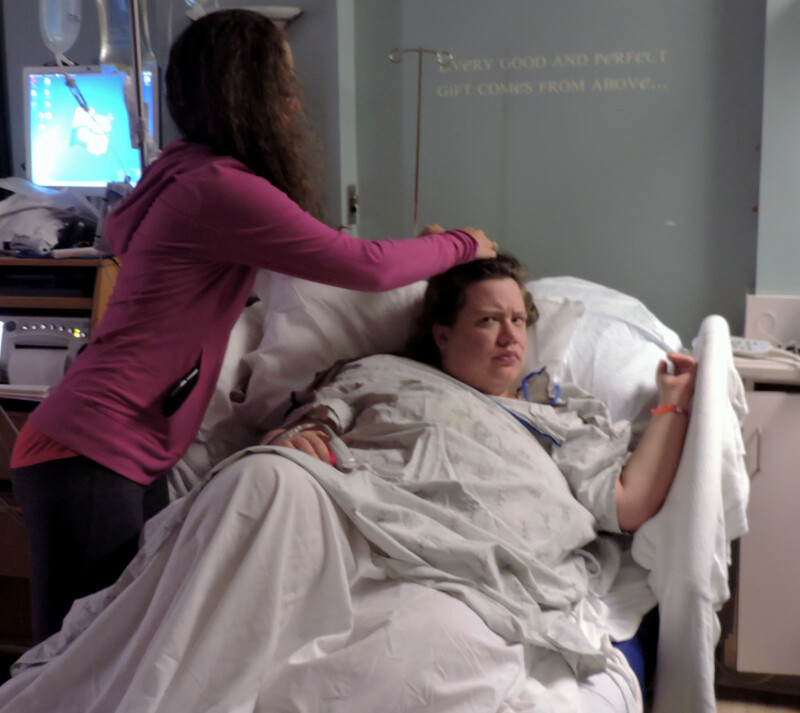 They had to get the staff, wait for an open OR, to prep me – we had a bit of time, still, before the moment would finally arrive and I would have my baby in my arms. That time in between ended up being a really beautiful, loving time, and I’m so glad we had it. Lauren arrived back from the dance studio, and just sat by my side and held my hand for a while. She told me she loved me and was proud of me. I felt safer and stronger, having her back with us, having her hold my hand and not say much, but look me in the eyes and tell me silently that she believed in me. All of us – Shaun, Lauren, Emi, Jeannie, Kristin and Mama – sat and just – talked. Processed. We discussed everything we had just talked about, all over again, and the more we talked, the more I felt convinced this was the right decision. I was able to calm myself, and gather my strength again – because what was about to come was almost scarier to me than giving birth vaginally might have been. I remember feeling very peaceful during this time, and very grateful for everyone there. I remember feeling grateful that I had this time to talk with my closest loved ones, to really cherish these moments. Finally, I felt I was getting my holy, spiritual moments. Emi had suggested that maybe Shaun go take a walk to clear his head and gather his wits about him. He’d been through an ordeal of his own, watching me struggle both physically and emotionally, and he had been such a rock for me, the entire time. Now we were about to embark on an ever bigger adventure, and I’m so glad Emi suggested he take a few minutes to breathe and relax by himself. But him leaving left me with a room full of women – and that felt so perfect, in the last hour before my birth. We had this beautiful feminine energy, so much love shared between all of us. I felt very loved and cherished, and for the first time in a week, I felt safe and certain about the path we were about to walk. After he came back, things finally got moving. Nurse K came in and started to tell me what all we’d need to do to prepare – I’d been wearing my tank top and sports bra for the last few days, and I finally took those off and put on a hospital gown. We were told I had to take all my jewelry off, so off went my necklace with my amethysts and my weddings rings, off went my protection bracelet of rose quartz, amethyst and obsidian, off went my Uganda earrings Emi had given me. I was really trying to convince them I didn’t need to take out my nose ring, as I didn’t want to, and then I had one more earring in my left ear that has never ever been out of my ear ever since Rachael and I got them pierced together my freshman year of college. I can’t, I explained to K, I would, I’ve tried – but the back is fused on, you’ll have to get some wire cutters or something to get it off! She allowed that maybe I could keep that one in, and at that, she thought maybe I could keep my nose ring in too. Lauren rebraided my hair for me, Kristin came in with a razor to shave pretty much everything ever – we were laughing again – and then I was about ready in terms of preparations I could take care of. The nerves started to creep back in as the surgicalteam came in to have me sign papers and explain the risks of the surgery. 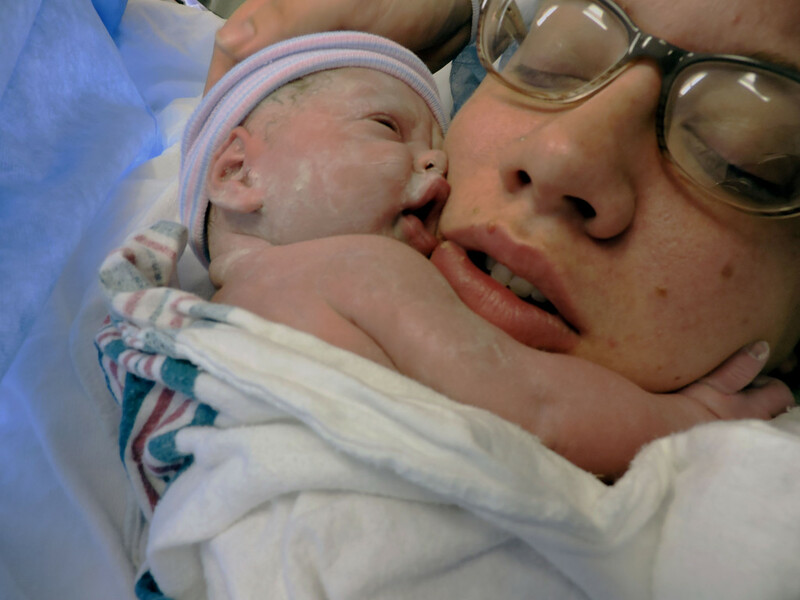 I had been terrified of having a C-section – and now I had to have one. 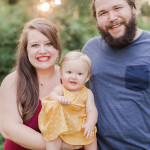 It had seemed a relief to know I was going down this road instead of struggling to give birth when my body and my baby weren’t ready for it – but now I had to face literally my worst birthing fear. Nurses and surgery assistants hustled in and out, getting the bed ready, getting my IV ready. My support team had backed out of the way to give the nurses space to work – and suddenly, I very much wanted them very close to me. I knew they were all excited – within the next hour or so, they would get to see my little baby, finally. For them, the end was nearly in sight. For me – the hardest part was just beginning. Nurse K came over and told me she was going to give me two different medicines – both of which were meant to clear the digestive system and get that whole area ready for surgery. This one, she warned me as she put it into my IV, this one can give you a weird anxiety crash. So if you feel like the world is ending, don’t worry, that’s not you, it’s the medicine. It will pass. I am so, so glad she warned me of this – because, yes. That anxiety panic hit me hard and fast, and it took me a moment to realize what it was. If you’re an anxiety sufferer, you understand that anxiety seems so real when it’s affecting you, it’s hard to accept that it’s just anxiety and not you thinking those thoughts. Around me, the staff had wheeled in the bed that would take me to surgery, my support team was getting the room tidied up and packed up, everyone was talking with excitement, snapping pictures, all of them swirling around me – and inside my mind, I was having a crisis. I can’t do this, I remember thinking, as they shifted me off my birth center bed and onto the OR bed. I can’t do – any of this. I can’t do it. 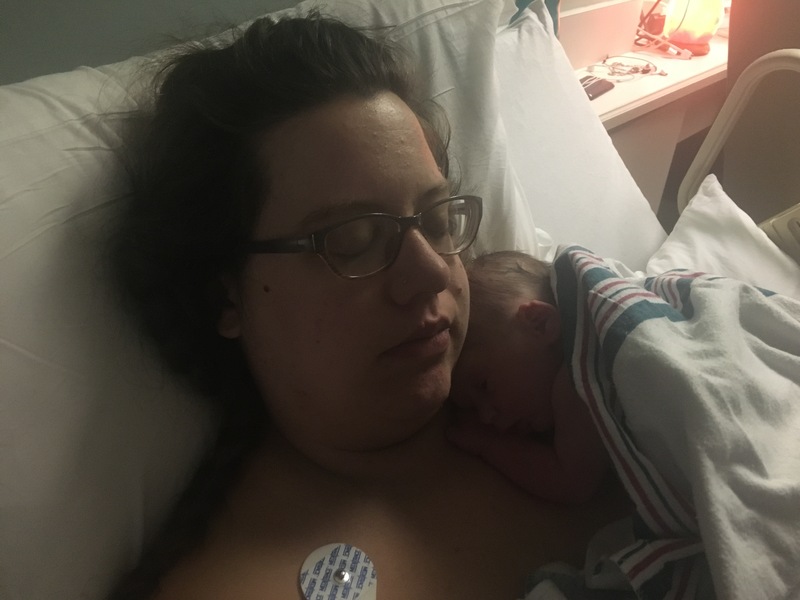 I can’t give birth vaginally, I can’t have a C-section, I can’t have a baby! I can’t do this, I can’t be a parent! And worse – I can’t tell anyone! I don’t have any choice! They have to get this baby out of me and I can’t do it! I can’t be awake while they cut me open! This is wrong, wrong, wrong, and I can’t tell anyone I can’t do it. I honestly didn’t know what to do. I rationally understood that not giving birth was not an option, at all, but especially now. I knew I had to get the baby out of me, sometime, I had committed to this and I had to see it through. I was terrified. I was terrified of all of it – ending this pregnancy, having a C-section, having a baby, becoming a parent. I was acutely aware it was too late to back out now, and I certainly knew I couldn’t tell anyone I’d suddenly decided in the last few minutes that I didn’t want a baby after all, thank you very much, that someone else would have to do this for me, I was out, I was done, I was over it. Luckily, about that time, I realized this was the anxiety crash Nurse K had warned me about. But anxiety seems awfully real, and once that fear took hold of me, it refused to let go. I didn’t know what else to do except keep quiet and go along with what everyone told me to do. I had to fake my bravery and pretend I thought I could do this. They had told us that they would get me in, get me situated and they would have Shaun come and join me just before they started the surgery. And yet again, I was so, so lucky to have Kristin there – even though she wasn’t clocked in, they allowed her to accompany Nurse K into the OR and be with me. 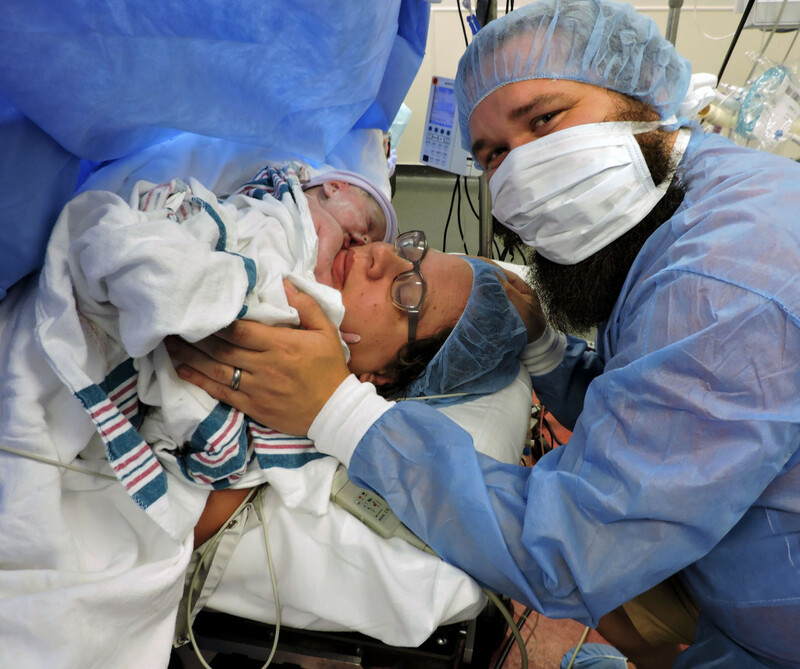 And because they had extra hands on board, a near miracle would be allowed – I would get to have skin-to-skin time with my baby within minutes, maybe even seconds after her being born. 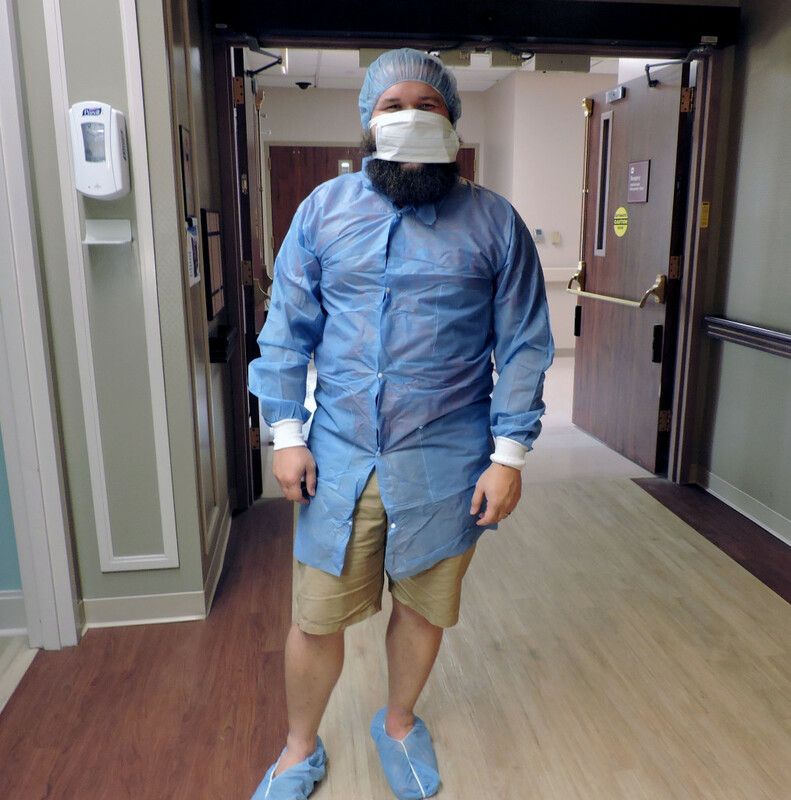 But with both Kristin and Shaun suiting up to get ready for surgery, and all the surgical team had left to prepare me for surgery – I had to be alone for quite a while – alone in my terror. 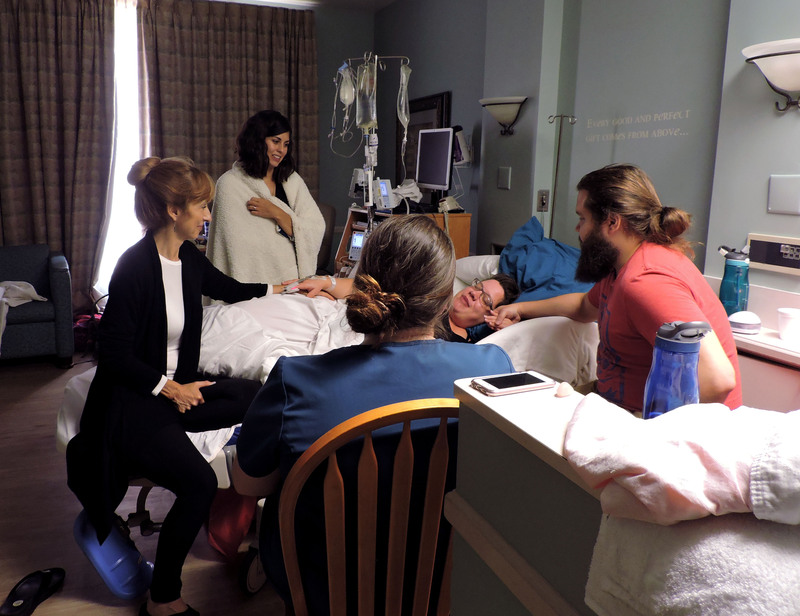 My mama, Jeannie, Laureny, and Emi all gave me final hugs and kisses, Shaun gave held me for a long moment and whispered sweet, loving words in my ear – and then they wheeled me out of my room, and headed for the OR. I lay there, terrified. I lay there too scared to tell anyone. I lay there convinced that I couldn’t do it, wondering if I would have to tell someone that they’d have to put me under. I was convinced I was not strong enough to be awake while they cut my baby out of me. I wanted to shake to pieces even thinking about it. I wanted to scream, I wanted to throw up, I wanted to blink my eyes and wake up and have everything magically be fixed for me. Instead, I lay there, silent, watching the hospital pass by. We moved through a hallway with a big atrium in the middle, huge windows with sunlight pouring in, so many trees in the middle. Perhaps those trees gave me what I needed, in those moments of panic. Those trees were a tiny bit of nature and calm and seeing them grounded me just a little. And there was an angel among my surgical staff. I will probably never forget this woman, whose name I don’t even know, who was only doing her job as she did any other day – but she did her job so well, it helped me so intensely. She had recognized my last name, and asked about my mom, because of her work, she said Mama had come to speak at her church and she remembered her. So that was heartening. Then, as we wheeled into the operating room, she became everything I needed in those moments prior to the surgery. The operating room was smaller than I expected – TV shows make it look huge, but even in my cloud of anticipation, I guessed this was a smaller surgery in a smaller hospital, maybe we didn’t need it to be huge. It reminded me of a classroom from my high school, except clean, blindingly white. Seeing all the instruments and lights waiting for me – and the operating table itself – rekindled my fear. This sweet woman started to explain what was going to happen to me. That alone helped me so much. Watching the nameless hustle and bustle of preparations scared me because I didn’t know what was going on. Even just giving names and descriptions to things and actions calmed me. She sounded so resolute and calm, as if this was an everyday occurrence – which for her, it was. As if C-sections happened all day every day, and not just to me, alone. This was normal, and to the staff – not scary. The fact that it was a calm part of their job, the same way I’d email reports and reconcile invoices, reminded me they were well-trained to do this. They shifted me off the rolling bed and onto the operating table, and it was time to get my spinal. I was just as terrified of the spinal as anything else. I hate that I knew what was going to happen to me – I didn’t want to think about a needle going into my spine, that the anesthesiologist would have to find space in between my vertebrae. I didn’t want to think about what could go wrong, or how badly it would hurt. My sweet angel lady explained all to me in detail, warning what I would feel. She told me first they would get the first needle in – that would be what would hurt, so to speak, although she described the sensation like a bee-sting. Then he would work to insert the actual spinal, which shouldn’t hurt she said – but I might feel jolts like an electrical current as they worked to find the nerve. She helped me to sit at the edge of the operating table with my legs hanging over. She guided my legs to a little step stool so I could hold myself up. I’m going to have you hunch over your belly as much as you can, she told me, that’ll help expose the spine. Then you just lean your head on my shoulder, and I’ll hold you, OK? She was so matter of fact and kind. She wrapped her arms around me, and I know it was just to keep me from jumping or moving too much while they inserted the spinal – but it helped. She guided my head to her shoulder and just held me like my own mother might have in that moment, and it was exactly what I needed. She asked me questions about our baby as the anesthesiologist prepared all his tools, distracting me from what was to come, from all the other surgical staff scurrying around us. It felt as if we were safe on our little island there, while a storm of action swirled around us. The bee-sting sensation she described, well – if that’s a bee sting, that’s the world’s most giant bee. It definitely hurt, that needle stick – but it wasn’t anything I couldn’t handle. It wasn’t unbearable, it wasn’t so bad as I had feared it might be. And once in, the needle site didn’t hurt. The next bit – the actual spinal insertion – was one of the weirdest sensations I’ve ever felt. I definitely had some discomfort at the needle site then, but it didn’t exactly hurt – but then suddenly, WAM – WAM-WAM-WAM – my legs jumped of their own accord, it legitimately felt like I had stuck my fingers in a light socket. It was absolutely bizarre, and it didn’t hurt so much as shock me – I had never felt a sensation like that before in my life, my teeth had chattered together, it didn’t feel like anything physical, it had felt mechanical and electric. Good job, my surgical angel said, that’s all done, I’m going to help you lay down now before it kicks in too much. I lay back on the operating table as she explained she’d be putting a sort of compression socks on my calves, they would inflate and deflate in turns during the surgery (and actually for the next 24 hours) every few seconds to keep the blood flowing. They strapped both my arms down, although one would be released once baby was out, and I hated that feeling too – I felt pinned like a bug, ready to be opened up, and it was the most unnatural, scary feeling to feel so trapped and exposed like that. Lying back, the fear started to creep in again. My sweet surgical nurse had to move down to actually get ready for the surgery, and I lay there under the blinding light, simply trying to focus on my breathing, and not having a panic attack – because I felt nearer and nearer a panic attack, the closer and closer we got to the surgery starting. Luckily, Kristin came in just a few seconds after. She joked and soothed, and although I could barely speak back to her, I was so petrified, her presence made me feel safe again. She was someone I knew, someone familiar, someone I knew cared about me. I suspected that the staff had actually started the C-section, but it was difficult to tell, as the sensations my waist and below were quite curious. I really, really, really wanted Shaun, and I was afraid they were going to start the surgery without him – and then I heard Kristin ask about him, and get him and bring him in. Shaun sitting on a stool by my head was my saving grace. I was still terrified, but with him there, his hands brushing my head, whispering praise and support to me – I could bear it. I could focus. And all I did was focus. I breathed, and breathed, and breathed – stronger and steadier than I had at any point before in my induction. 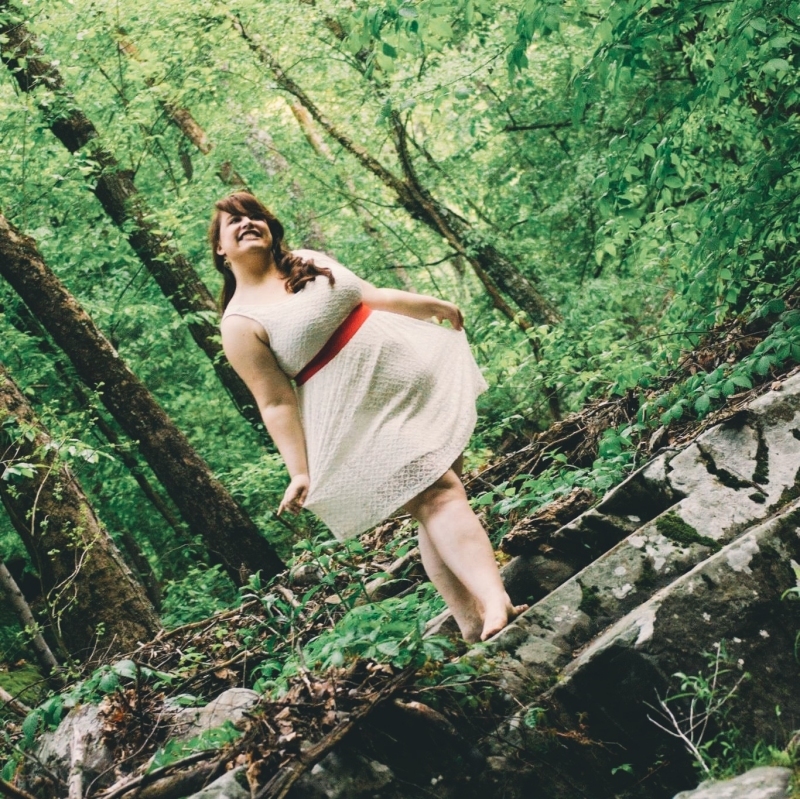 My deep, strong breaths were the only thing keeping me from going into a tailspin of panic. Talk to me, I told Shaun, talk to me, keep me calm. And I’m not sure he said anything specific, anything brilliant – but everything he said was absolutely perfect. I focused on his voice, and my breathing – and ignored everything happening behind the blue drape. If I slipped for a second, I could hear the doctor and the staff saying things quite indicative of the major surgery they were performing – pull that back there, hold on to this here – and if I listened to them, the panic rose – I could visualize what they were doing. Mostly, I lay there and pretended nothing was happening to me at all. I had asked Kristin and Nurse K before, what the surgery would feel like. I’d always heard you couldn’t feel pain, but you could feel something. Both Kristin and K tried explain it to me as best they could, and before my surgery, their words didn’t make sense. During – they were pretty close – but it’s nearly impossible to describe how it felt. My lower body felt as if 10,000 heavy blankets had been piled on top of it – soft, fuzzy feelings, as if the great weight had put my muscles to sleep. Anywhere the surgery was not happening, I felt that dead muscles feeling – as if I’d sat on my leg too long and it’d gone to sleep. In my belly, I felt – well, nothing. But also everything – every tug and pull and shift. But I didn’t feel it, exactly. That same dead muscles feelings, as if surgery were being performed in a dream where sensations don’t quite match up with actions the way they’re supposed to. Everything felt as if it were happening far away from me, on a different planet, yet still inside of me. I could definitely tell when they tugged or pulled, but it didn’t hurt me. It was almost as if I just felt the motions but not the sensation on my skin and muscles and organs. I don’t remember who exactly said exactly what – possibly it was Kristin – but someone said something that made Shaun and I pay attention, probably something along the lines of, here she comes! The moment we had been waiting for – for nine months, certainly, but as a dream months and years before that – was finally arriving. I felt this sudden curious lightness in my belly, I literally felt them pull her from my stomach, and it surprised me – it makes sense, I realize now. But where my belly had been so heavy and full for so many months, it was suddenly effervescent with emptiness as our daughter was lifted into the world. And then – the most beautiful sound in the world – we heard this sharp little intake of breath. This is where I started to cry. Shaun raised his head high enough to see her, pulled free, seconds after being born – apparently I told him no, no, sit down! because I was scared of him seeing my insides – and then they handed her off to Kristin and K. Kristin had told us, as soon as I can bring her to you, I will. We’ll have to check and make sure she’s breathing, and that everything is OK, and if it is, I’ll bring her straight to you. 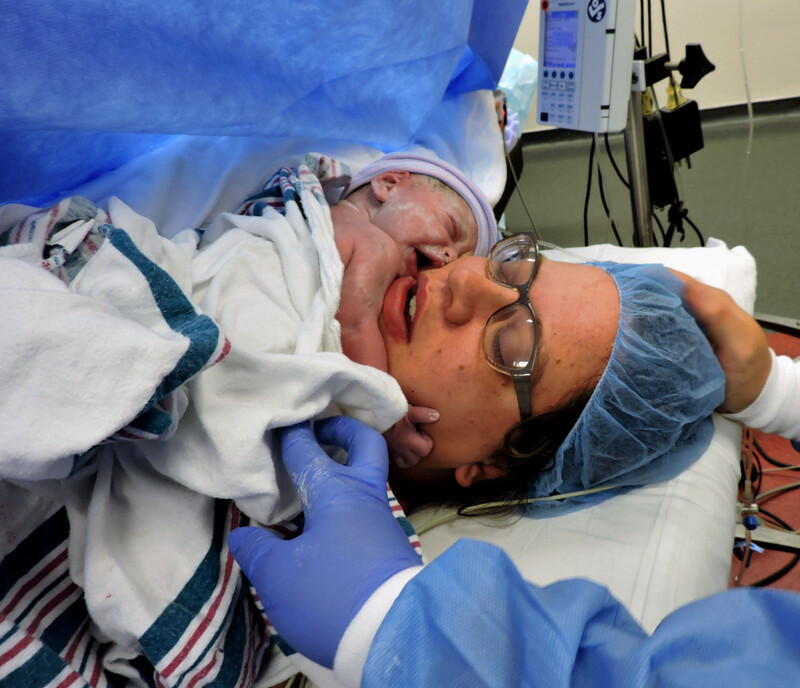 I just want to reiterate – skin to skin contact in the OR is a rarity at this hospital. In fact, it’s nearly impossible. Kristin couldn’t name another example of when it had happened – and I know I got to experience it largely because Kristin was there and advocated for me. Because she put in the time and showed up on a day she wasn’t supposed to work – she was an extra pair of hands that allowed me to have this beautiful gift, and I can never thank her enough for this. I don’t know how long it took, and I certainly couldn’t see anything going on – but I could hear my girl crying, and that was the best sound. I’d been fearful of that endlessly long few seconds after birth – whether vaginally or by C-section – those few seconds when the medical team has to make sure baby is breathing well, and I knew sometimes it could take a little bit. I couldn’t imagine the agony of waiting to hear breathing and crying, waiting and praying that everything was OK – and we didn’t have to. Baby Girl was as strong earthside as she had been in in the womb. She cried loud with strong lungs. She’s covered in vernix, Kristin called, she’s such a cheesey baby! They freed one of my arms, and then, oh, Kristin placed my baby on my chest and face. My little baby clung to my face as Shaun gently touched her, and I held her with my free hand. I felt, more than anything, this incredible sense of relief. I was so relieved that it was over, that she was here, that she was healthy and strong and SAFE. She was safe outside of my body now, and I could see her and touch her and smell her and hear her. I couldn’t really articulate any other emotions except relief. There was happiness and shock and disbelief, yes – but mostly I was so relieved that we had done it, that the hardest part was over, and we could touch her and see her and feel reassured that all was well. For what felt like a long time, I got to have her naked body on my naked chest, cradling her as best I could with one arm. I think I asked if I could have my other arm free and they said no, but Shaun helped me support her. He had tears in his eyes and he couldn’t stop smiling that crinkle-eyed smile of his. I don’t even know that I talked to our baby that much, I just held her and soaked in the moment, I felt such strong, nameless emotions, I was so overwhelmed, I couldn’t speak more than hi and I love you. And then – they had to take my baby from me. I hated it, but they had to finish the surgery, they had to get Baby Girl taken care of – we were lucky to have as much time as we did. I did not want to be separated from my baby, once she was here, and I didn’t want Shaun to leave me. I didn’t want to be left alone in the operating room for that terror to seep back in and consume me again. Yet again – luckily, Kristin was there. Shaun kissed me and told me he loved me, and he went with our baby to the nursery – but Kristin got to stay with me, and thank God I had a familiar face for the last half of the surgery. And Kristin promised if all went well, she’d bring my baby to me in the recovery room so we could have more skin-to-skin time. I remember feeling like closing me up took a really long time. 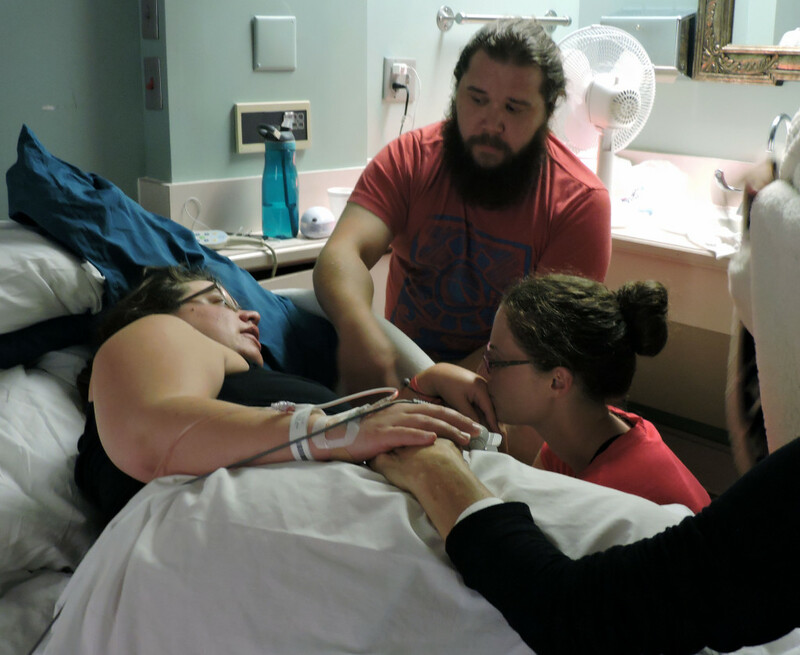 I really wanted it to be done – I wanted my fear to go away, I wanted to be out of the OR and back with my baby and my husband and my loved ones waiting for me. I wanted to be unstrapped from the table, I didn’t want to be awake with someone handling my insides anymore. I also had started to feel nauseous, and they had warned me if I did, to tell them and they’d give me something in my IV to help with that. Kristin had been bustling around the OR, helping here, then coming back to check in with me – and I told her I felt sick. She told the anesthesiologist and he pushed something through. I started to feel very sleepy – and that certainly made sense. At this point, I hadn’t slept much in nearly 48 hours, and had been pumped full of all kinds of drugs, and whatever nausea medicine they gave me only added to all that. I couldn’t believe it, but I kept falling asleep on the operating table. Wake UP, I would order myself, every time I drifted off. This is IMPORTANT, someone is rifling through your GUTS, you need to be awake for this. But I couldn’t help it! I kept drifting off, and then waking up to a particular strong tug or push in my belly. It still seemed to take a long time, I kept hoping they’d tell me I was done, but they kept working. I was pretty foggy by the time they actually finished – I have vague memories of being shifted back onto a rolling bed, and being rolled through hallways to a different area. I can tell you nothing about the recovery room except there was a blonde lady who was very sweet to me and told me congratulations. 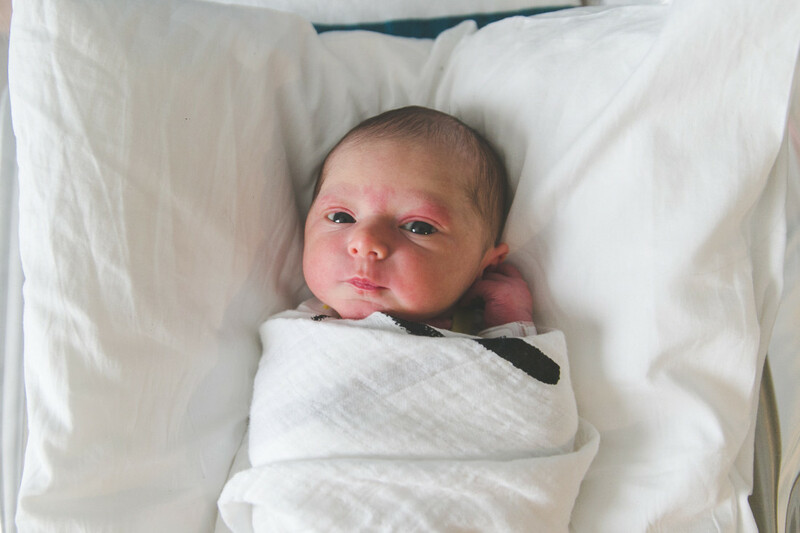 Shortly after, Kristin was back with my baby, and free of the surgical drape and being strapped down to the bed and all that hoopla – I could cradle her in both arms against my chest. I don’t know what all the medical staff did to me while I waited there, I just knew I had my baby on my chest where she belonged. The recovery room nurse told me she was beautiful, and I agreed. I felt very peaceful during this time. I didn’t feel any pain at this point, due to the pain meds through my IV, and that feeling of relief stuck with me. I was so happy to be done with the fear and the terror and the anxiety. I was so grateful to have come through the C-section with no issues. More than anything, I was so, so happy to have my baby in my arms. 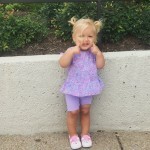 The worst was over – and this had been so much of the motivation behind stopping the failing induction and choosing a C-section. I was not hysterical. I was not crying (or at least, nothing other than tears of joy). My fear had melted away. I felt safe and cozy, and my baby was safe and cozy on my chest, in my arms. 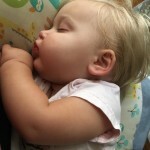 I was able to enjoy this time after she was born, instead of feeling terrified and panicked. After some time, I was judged ready to go back to the birth center suite and see everyone. My baby still on my chest, the medical staff began pushing us back through the halls. I was still pretty foggy, but the clearest memory I have of that time was passing through the hallway with the tree-filled atrium that had given me the tiniest bit of comfort on my way to the operating room. Now, passing by it again, it filled me with such joy. I realized my daughter was seeing trees – one of my favourite things, one of the most beautiful creations in nature – for the very first time. 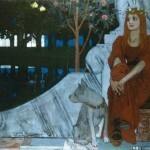 Look, Ariadne, I murmured, trees! My eyes fill with tears when I think about that moment. It was so beautiful – the summer sun was just starting its descent and it had filled the atrium with this beautiful golden light, illuminating the green tree leaves. My daughter snuffled on my chest and I felt such calm and joy and gratitude. It was the first time I had used her name, out loud, to her, and it felt like I had come home to this beautiful place I had been longing to get to for years. This is my space to share my writing, my my pictures, my adventures, and my opinions. I love: my husband, Shaun, and our clever, funny, beautiful daughter, Ariadne. I love sitting in the swing with both of them as the crickets sing and dusk falls over the yard. I love moments in quiet thought, laughter and a good dance class and a good song on the radio and the windows rolled down. Porch sitting and long naps and hugs and reading anything I can get my hands on. 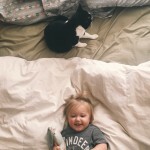 Talking with old friends and snuggling under quilts. Singing old songs and adding the harmony. My mama. Our precious family of friends. Our cat and tacos and hummus and sushi and curry. All my blessings, big and small. If you want to see me at my gluttonous, watch me eat a baked potato.